People do not realise how much effect eyebrows have on facial features until they see a person without them, or with visible eyebrow hair loss. An eyebrow transplant can improve facial apperance by implanting your own hair into the eyebrow area, the hairs look exactly the same as your eyebrows would if they were naturally thicker. 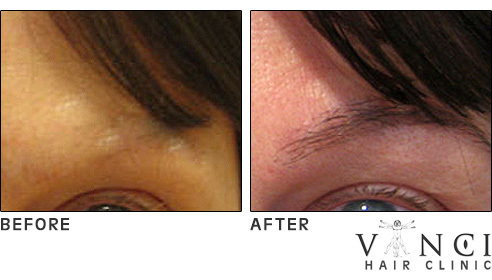 Hair is removed from a suitable donor site and transplanted to create naturally looking eyebrows. Our hair loss restoration team are experts at creating exactly the right angle for growth and the procedure is carried out under local anaesthesia. What Results Can You Expect From An Eyebrow Transplant? Due to the relatively small area that needs to be covered for an eyebrow transplant, with correct planning and designing a eyebrow hair transplant can achieve the maximum possible aesthetic effect. After the eyebrow transplant procedure, usually within a 6 to 12 month time span, the transplanted hairs will have re-grown fully and the shape of the eyebrows will have been restored. The results will be totally natural-looking and permanent.